We are a local bakery specializing in artisan breads and baked goods, crafted by hand in small batches. We use local and organic ingredients because we care about the products we put on your table. The tradition of breaking bread with family and friends is ingrained in our history; we have deep roots in Barrie. Owners Cait Patrick and Lise Garden studied under world renowned Certified Master Baker Jeffrey Hamelman. With local organic provisions and a hefty pinch of passion for the craft, we bake this time honoured food staple for your table. The science of sourdough or naturally leavened bread is alchemy in action. The starter is where the magic begins, it is truly digestive greatness; believe us your gut will thank you! Sourdough or naturally leavened bread is more easily digested than regular bread, both white and whole grain; it is also far more nutritious. If you aren’t into the science of food, come to Homestead and try a slice, if you want to read about the basics of why this is better bread, here is some information for you to bite into. Lactic acid makes vitamins and minerals in the flour more available to the body and helps to neutralize the phytates in flour that interfere with absorption. Yes, we know it sounds technical. These acids slow down the rate at which glucose is released into the blood-stream and lower the breads’ glycemic index (GI), which means it doesn’t cause insulin spikes. This is also very important for people who are diabetic. Sourdough bread with all its goodness also renders gluten in flour more easily digested, which means it is less likely to cause food intolerance. It tastes good, toasts well, it is better bread. We invite you to talk with us for more details, if you have further questions consult with your dietician. 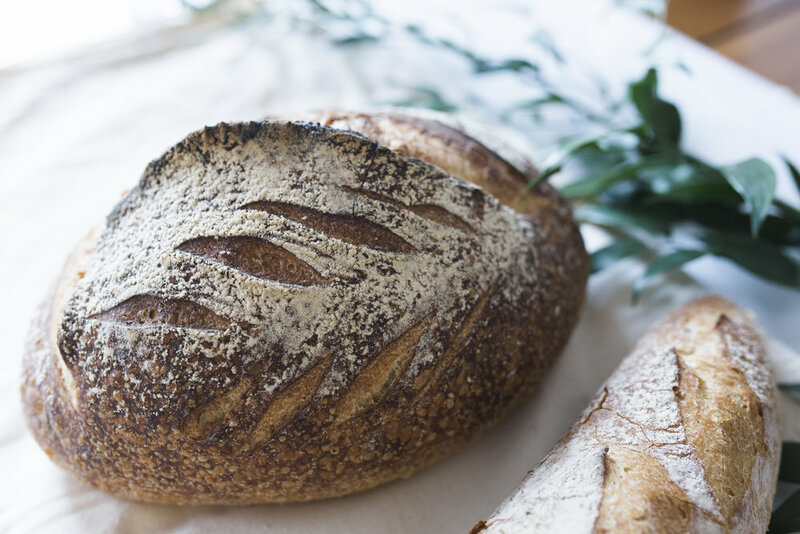 The local flours we use in our sourdough, naturally leavened bread baking process include; Rye, spelt, whole wheat, unbleached organic all-purpose, buckwheat, semolina and red fife. Come into the Homestead to try a slice of better bread!